Between the world wars, no sport was more popular, or more dangerous, than airplane racing. While male pilots were lauded as heroes, the few women who dared to fly were more often ridiculed—until a cadre of women pilots banded together to break through the entrenched prejudice. 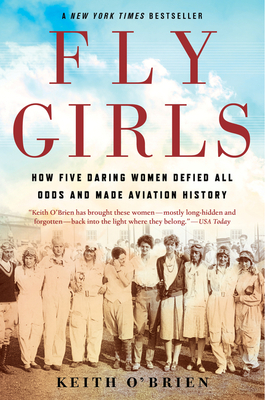 Fly Girls weaves together the stories of five remarkable women: Florence Klingensmith, a high school dropout from Fargo, North Dakota; Ruth Elder, an Alabama divorcée; Amelia Earhart, the most famous, but not necessarily the most skilled; Ruth Nichols, who chafed at her blue blood family’s expectations; and Louise Thaden, the young mother of two who got her start selling coal in Wichita. Together, they fought for the chance to fly and race airplanes—and in 1936, one of them would triumph, beating the men in the toughest air race of them all. Keith O’Brien is journalist who has written for the New York Times and Politico and he’s a longtime contributor to National Public Radio. His work has appeared on shows such as All Things Considered, Morning Edition, and This American Life. He is a former staff writer for the Boston Globe and the author of Outside Shot: Big Dreams, Hard Times, and One County’s Quest for Basketball Greatness. He lives in New Hampshire.